The College Board announced today that college prices for the 2009-10 academic year continue to rise as state funding and endowment values decline. 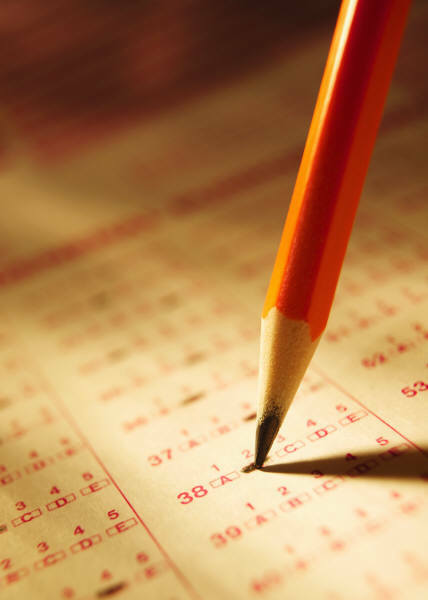 The financial difficulties facing households across the nation are putting increased pressure on financial aid budgets. With the economy struggling, parents and students dared to hope this year might offer a break from rising college costs. Instead, they got another sharp increase. Average tuition at four-year public colleges in the U.S. climbed 6.5 percent, or $429, to $7,020 this fall as schools apologetically passed on much of their own financial problems, according to an annual report from the College Board, released Tuesday. At private colleges, tuition rose 4.4 percent, or $1,096, to $26,273. Hit hard by state budget cuts, four-year public colleges raised tuition and fees by an average of 6.5 percent last year. Prices at private colleges rose 4.4 percent, according to a report issued Tuesday by the College Board. “Given the financial hardship of the country, it’s simply astonishing that colleges and universities would have this kind of increases,” Mr. Callan said. “It tells you that higher education is still a seller’s market. The level of debt we’re asking people to undertake is unsustainable. I’m sorry, but give me a break. I totally understand the tuition problem. My university is going to raise tuition by 30% over the course of two years. Ouch. That will certainly strain students that don’t have financial aid. But what exactly were people expecting? 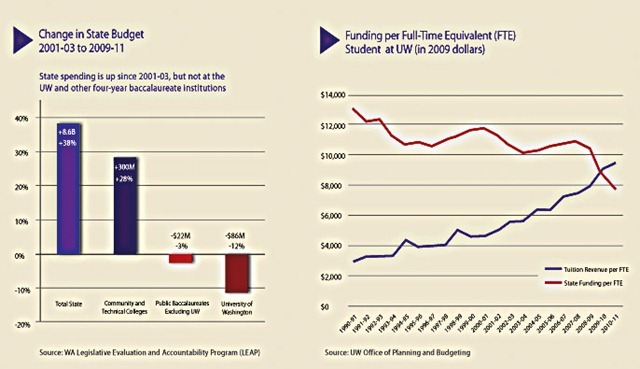 The state of Washington cut almost 30% of the UW budget. The voters in Washington made it clear that there were other priorities. So, UW has two choices: shrink by 30% in 6 months (about the length of time we knew what was going to happen). Shrinking by 30% is certainly possible – but it would be huge. We’d have to take about 30% less students than we do now – that probably would mean no incoming students this year at all (or we would have to kick out students that were already here), fire 30% of the faculty, close lots of departments. Probably have to completely kill off research. Actually, that would help with firing 30% of the faculty – most of us would just leave as fast as we could. Students who came to a major research university for learning would now be at what was basically a teaching college full of very pissed off professors – not what they signed up for. So Seattle raised tuition by 30% and took a 6% over all cut to the operating budget. All signs point to the same thing happening in the next two year budget as stimulus money disappears. So look – we like to call these things public universities – but that implies public support. Frankly, the more the state backs out of its implied contract with the university, the more like a private university these institutions will look. At some point the state support will be small enough that the universities will want to change their relationship with the state. Heck, why deal with the oversight if they aren’t getting anything in return for it!? Somewhere out there there is a year-by-year trend plot of state support of universities. It has been steadily falling for over 20 years. This last year was particularly bad, but not really that different from the trend overall. California is at risk of destroying one of the best university systems in the country over this very same issue. Want to keep tuition down? Keep public universities accessible? Don’t just yell “cut costs, get rid of waste” at the universities. Make sure your state legislature continues to support the university as well. The budget has to balance. If the state gives less, then that extra money has to come from somewhere! Ah, the soap box. How I have missed thee. Faculty and staff members at the University of California will be placed on furlough starting in September for seven to 26 days per year, according to a plan released today by the system’s president, Mark G. Yudof. The plan, which is expected to be approved by the university’s Board of Regents next week, will amount to a salary cut of 4 to 10 percent, with the highest-earning employees facing the largest cuts. The temporary furlough will push the university’s faculty compensation to about 20 percent behind comparative institutions, university officials said at a news conference. “We’re going to really have to work hard to come up with creative means to retain the excellent faculty that we have now and to further recruit people,” said Mary Croughan, chair of the university’s Academic Senate. I feel for California. The state of Washington was in the same place. They are cutting salaries, reducing classes offered, and increasing tuition to try to close the budget gap. We did almost the same thing except for the salary cuts (and we raised tuition considerably more than they did). The trade off is interesting. That second paragraph points out the danger to this approach – others will poach the faculty. Hopefully California can fix the problems they have (economy comes back enough, change proposition 13, etc.) – they have some time as very few people have money to be poaching other universities. Things are bad here in Washington, but at least I know the future and can plan on the cuts. The California budget crisis is still ongoing – and perhaps the legislature will pull back at the last minute. But given the constraints I don’t see how that will happen. The University of California system is one of the gems in the nation – it is too bad seeing something like this happen. This cartoon made me a bit sensitive. Here I am in the South of France. I’m in an apartment with a great view of the sea… It sure feels like I’m kicking back. Of course, I’m still working like crazy (especially since my family hasn’t joined me yet). What was the first thing I spent money on here in Marseille? It wasn’t cheese. It wasn’t even Pastis. It was a bit 1080p monitor for my computer so I could work efficiently from the apartment I’m renting. I spent 150 euros for my three months here. But 2 days a week? What university is that guy planning on working in!? 🙂 And do they pay decent money? Sign me up!